​Seabourn's first World Cruise in six years is destined to become a classic. Join an intimate group of like-minded travelers on the stunning all-suite Seabourn Sojourn as she travels the world. ​off the cruise only fare*. *All fares are in U.S. dollars, cruise-only, for new bookings only, per guest, double occupancy, and subject to availability. 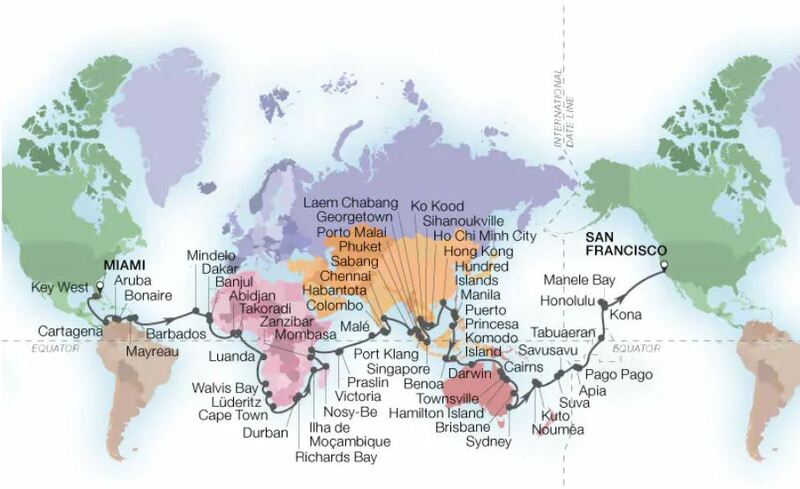 Taxes, Fees and Port Expenses of $3,665 are included for the 146-day Full World Cruise. Standard pricing terms apply, in addition: Full World Cruise Amenities apply to World Cruise Guests only on the full 146-day World Cruise. Air Offer: Complimentary World Cruise Air available for a limited time, for guests purchasing the full 146-day World Cruise (all segments) will receive Domestic First Class Air. All Air Packages are: (1) valid for full fare cruise guests booking/purchasing the applicable Air Package for roundtrip travel via Seabourn’s Flight Ease® program, (2) capacity controlled and subject to availability, (3) applicable to first and second full-fare guests per suite only, (4) limited to specific U.S. gateways, (5) and include one complimentary checked bag, additional fees for baggage and other charges may be directly assessed by airlines or airports; please refer to the applicable airline website for further information. 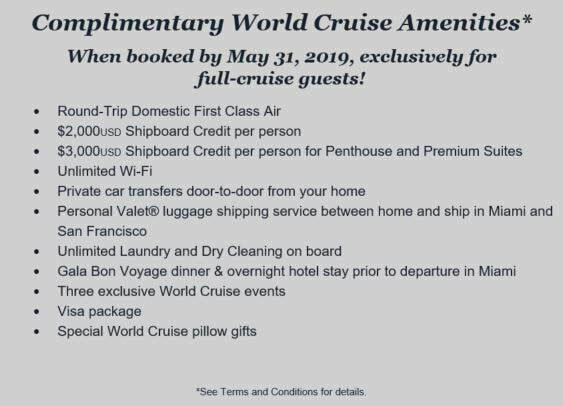 Shipboard Credit Offer: World Cruise Shipboard credit of $4,000USD per suite ($2,000USD/person) for guests booked in Ocean-view and Veranda suites; World Cruise Premium Suite Shipboard credit of $6,000USD per suite ($3,000USD/person) for guests booked in PH, PS, OW, SS, WG and GR suite categories only. All shipboard credit offers are in U.S. dollars and are non-refundable, non-transferable, not for cash value, expires at the end of the cruise, may not be used in the casino and are not combinable with any other shipboard credit offer. Unlimited Wi-Fi: Complimentary World Cruise Unlimited Wi-Fi includes (1) unlimited internet package per suite (guests booked in OW, SS, WG and GR includes (2) unlimited internet packages per suite). Wi-Fi service is not guaranteed. Seabourn is not responsible if Wi-Fi service is unavailable. No credit or other compensation will be provided should Wi-Fi service not be available. Transfers: Complimentary World Cruise transfers are provided to guests using Seabourn’s Flight Ease program only. This includes round-trip transfers between home and airport, airport and hotel, hotel and ship. Round-trip transfers between home and airport are limited to 100 miles. Luggage: Complimentary World Cruise Personal Valet Door-to-Door Luggage Service applies to Guests residing in the U.S., Canada, United Kingdom, Europe, and Australia only on the 146-day World Cruise. Luggage is restricted to 2 bags per Guest at 50lbs per bag. Certain restrictions apply. Visa Package: Complimentary World Cruise Visa package apply to U.S. and Canadian citizens only. Reduced Deposit: 50% reduced deposit offer is valid for new bookings only and expires on October 15, 2018. Applicable to U.S. and Canadian residents only on the Full World Cruise and World Cruise Segments. “PAY IN FULL” Offer: Pay in full by May 31, 2019 and save an additional 3 percent from the gross cruise-only fare after discount, not tariff. Applicable to Full World Cruise and World Cruise Segment guests, including third and fourth persons. Offers are capacity controlled, and may be modified or withdrawn without prior notice. Other restrictions may apply. All savings amounts are included in fares shown. Seabourn reserves the right to correct errors.